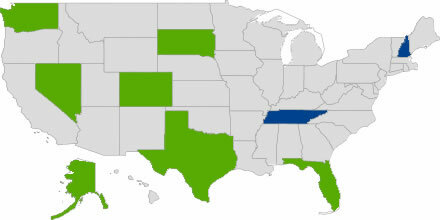 There are currently seven states which do not require you to file a state income tax return. Alaska, Florida, Nevada, South Dakota, Texas, Washington, and Wyoming. The two states in Blue, Tennessee and New Hampshire, require you to file only if you have dividend or interest income to report. Seven states — Colorado, Illinois, Indiana, Massachusetts, Michigan, Pennsylvania and Utah — have a flat income tax, while the rest collect according to income ranges. The ranges that apply to 2012 tax rates vary not only by percentage but also by the amount of brackets within the range, with the fewest being one, the flat tax, and the most being 12. Whether you plan to file as a single or married person also affects the percentage required. In California, married couples filing jointly simply double the percentage. The above percentages apply to taxable income, meaning that deductions can move you to a lower tax bracket. To learn what the income tax rates and brackets are for your state, contact your state’s department of revenue.